Reflexology, or zone therapy, is an alternative medicine involving the physical act of applying pressure to the feet, hands, or ears with specific thumb, finger, and hand techniques without the use of oil or lotion. Reflexology works as the pressure applied to the feet or hands interact as a part of the body’s nervous system creating: relaxation, improved circulation, exercise of the nervous system and the benefits of touch. Pressure sensors in the feet and hands are a part of the body’s reflexive response that makes possible the “fight or flight” reaction to danger. Feet ready to flee and hands ready to fight communicate with the body’s internal organs-think adrenal glands and adrenal… to make possible either eventuality. The sudden adrenal surge that enables a person to lift a car is an example of this coordinated activity. The perception of pressure by the feet and hands taps into the reflex network that makes possible our every move. 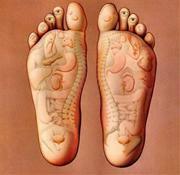 Reflexology, consistently applied, provides an exercise of these pressure sensors and thus a conditioning of the internal organs to which they are inextricably tied.